Chocolate roses are perfect gifts for loved ones. They can beautifully adorn tables at weddings, or make scrumptious holiday gifts. 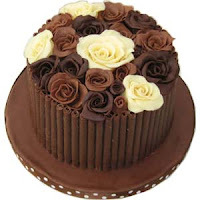 Chocolate roses are easy to create and can be made by children. Allow at least four days from the start of the project to the finished project. Place 10 ounces of chocolate in a microwave safe bowl, and heat for one minute. The goal is to melt the chocolate, but not to boil it. Remove the chocolate from the microwave and stir thoroughly. If needed, replace it into the microwave and heat it in 30 second intervals until the chocolate is completely melted. Remove the melted chocolate from the microwave and add a 1/3 cup light corn syrup. Mix well. Place a large sheet of wax paper onto a flat surface. Pour the melted chocolate onto the top of the waxed paper. Spread the chocolate out, with the rubber spatula, until it is about a ½ inch thick. Cover the chocolate with a sheet of waxed paper, and allow the mixture to sit overnight to make the chocolate dough. Pinch a small amount of dough from the chocolate dough. Roll it into a small ball and set it onto a clean sheet of waxed paper. Repeat this process until you have at least ten small balls on the waxed paper. Place another sheet of waxed paper onto the top of the rolled dough balls, and press the sheet gently. The chocolate dough balls should resemble small flattened disks. Curl one disk so that it is similar in appearance to a funnel. This is the center rose section. Place another disk around the center section. Press the chocolate together so that it connects firmly at the bottom. Repeat this process until you are happy with your rose. Allow your roses to dry for another 24 hours before painting. Mix powdered food coloring with cocoa butter to create food grade paint. The mixing ratio is generally six parts cocoa butter to one part food coloring. Add the cocoa butter to the food coloring until a paint like mixture forms. With a clean, food safe paintbrush paint the roses. Remember to add detail work to your roses. Work your way from the inside of the rose to the outside area of the rose. Place the rose into the freezer to speed up the paint drying process. Freeze your roses for at least one hour before placing them on your cake.